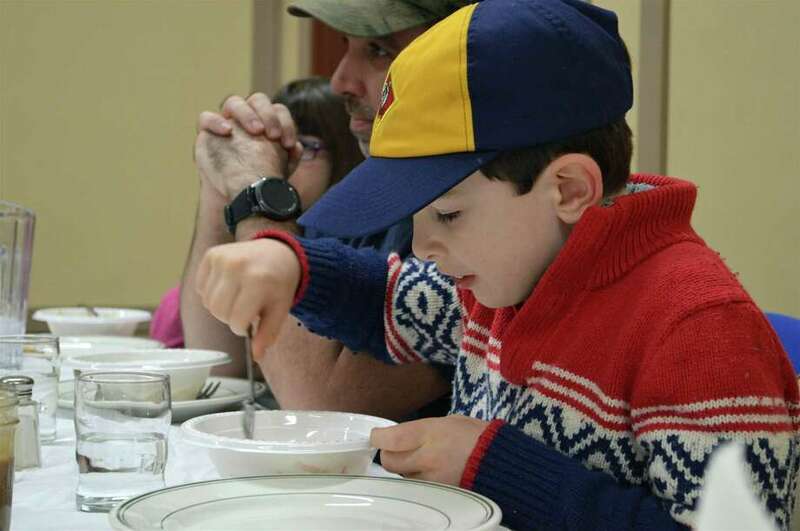 Scout Patrick Murphy, 8, of Fairfield, enjoys his salad at the Scout Troops 88 & 188 Spaghetti Dinner at Grace United Methodist Church, Saturday, Feb. 9, 2019, in Fairfield, Conn.
FAIRFIELD — The scouts from Troops 88 and 188 demonstrated Saturday evening that they were truly prepared to host their first spaghetti dinner at Grace United Methodist Church. Pasta, meatballs and more were on the table, and a dozen or so Scouts were on their feet — taking orders, serving food and generally doing their part to help raise money for theirs troops. “This will help support their programs,” said volunteer Sharol Harwood of Fairfield, who ran the event. The dinner proved not only delicious for the 100 or so guests in attendance, but was also a communal fundraising activity for the Scouts themselves. “They can all be part of it and participate in that project,” Schindler said.